Discover everything the Vineyard has to offer- great weather, fishing, beaches, restaurants, shopping... but without the crowds! Our nicely appointed house is ideally located halfway between Vineyard Haven village (home of the famous Black Dog Tavern) and bucolic West Chop, in a family-friendly setting of private 1+ acre wooded lots. It's less than 1.5 miles to great fishing, beaches, town, library and shopping, with Mink Meadows public golf course just 5 minutes down the road. Renovated in 2011, furniture, bedding, most appliances and nearly everything else has been updated. Grill out or just relax with friends and family on our spacious deck,- and the lawn provides ample room for croquet, volleyball, or any other activity your family can think of. Enjoy our new horseshoe pit! After dark, the deck and backyard provide the perfect setting for Vineyard stargazing. Our house has a breezy, open floor plan that easily allows for larger gatherings. The dining table comfortably seats 6-8, or 8-10 with the leaf inserted. There is an additional table on the deck that can also seat 8-10. The master bedroom features a queen bed, ceiling fan, and 1/2 bath. The sliding doors open onto the deck, and allow for plenty of natural light and provide cool breezes on warm summer nights. The outdoor shower is just steps away, conveniently built right on the deck. A second bedroom also features a queen bed and ceiling fan. New Kohler sink, toilet and fixtures have been installed in the main bathroom, and there is an additional 1/2 bath in the master bedroom. While TV is probably not on your vacation agenda, the living room does have a 32' flat screen, and there is a smaller flat screen in the master bedroom. You'll also find a supply of games in the living room for those occasional rainy days- please also see our website for additional rainy day activities and destinations. Working during your vacation can be a bummer, but if you must... we do have free wi-fi, phone and a charming 'vacation desk' made from old barnwood. I'm a born and raised Vineyard native, and while I've been away 20+ years, my wife, daughter and I have returned to the island every summer to visit family and friends. As a third generation native of Vineyard Haven, I know it well. The town has the perfect balance of beach, boating, walking and bike trails, great restaurants & shopping- all without the 'stuffiness' you mind encounter in other vacation spots. And while we're close to everything, our location has a distinctly 'up-island' feel; woodsy yet with enough land for a sunny backyard, and an occasional flock of wild turkeys stopping by. Vineyard Haven has it all. We spend a lot of time outdoors while on the island, so our deck and backyard get plenty of use for grilling out and playing games. We keep a boat in the Lagoon, just minutes away- the Lagoon is a great, uncrowded place for all kinds of water activities. We also love to ride bikes, whether it's into town for ice cream, or down nearby Herring Creek Rd, a scenic 1.5 mile dirt lane leading to Lake Tashmoo opening. Please see our website for links to sailboat/kayak/windsufer rentals, as well as great pics and video of the Tashmoo and Lagoon areas. toilet, In in mstr bedroom, is teeny tiny, but great to have! Nice-sized dining table seats 6 or 8 with the leaf inserted- great for family gatherings. Kitchen is well-equipped with plenty of cookware. We have booster seats for little ones. assorted games provided for rainy days! Great location as it a 15-20 drive to all of the other towns. Walking distance to the beach and a peaceful neighborhood. Thank you so much Wayne and Ann for letting us call your home our home this past week. We had beautiful weather and we had so much fun discovering all of the wonderful spots around the island. Your home was the perfect launching pad for the day and had all of the amenities that we could have wanted. 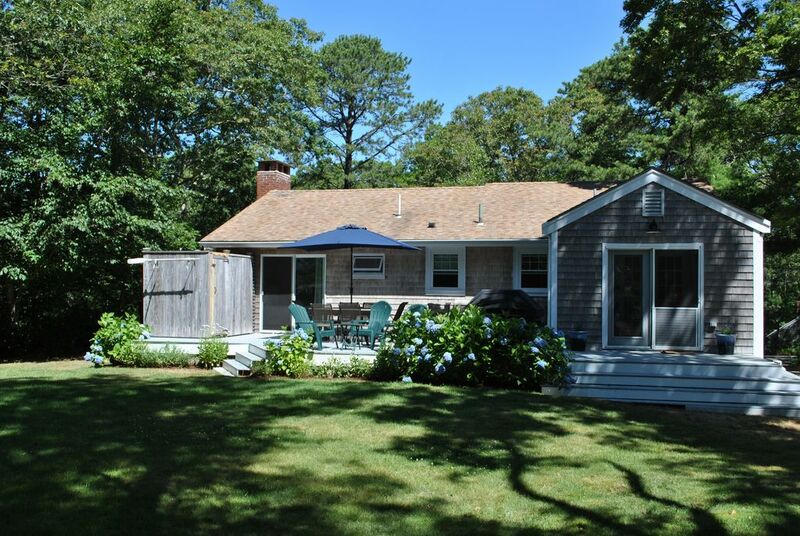 The location could not have been better, situated a short distance from downtown Vineyard Haven. We are already planning our vacation next year. This house has everything you can want - recently updated, close drive to the beach, outdoor shower, wifi, cable, washer/dryer, beach chairs/toys. Close drive to the beach and Wayne is very helpful throughout the process. My kids loved the bunk beds! Highly recommend it! Thanks Michael, so glad we could help your family have a great vacation! Everything about our stay at the Davey family rental was perfect – the home is a true gem!!!! Wayne and Ann are two wonderful people with a beautiful MV property. Wayne always responded very very prompty with any questions and was always very helpful. This was the first time we ever rented outside of a realty company and the experience and property exceeded our expectations. The rental was exactly as described and more!!!!! It is really a great home for a vacationing family (our kids are 3 and 8). The outdoor shower and the large enclosed changing area were fabulous!!! The bunk beds were a hit with the kids. There are so many wonderful touches throughout the house that are so thoughtful (the hampers in each room, folding table in the landry room, plenty of kitchenware) that make this rental such a top notch vacation retreat. The Davey’s neighbor Mr. Schoolfield is a very nice gentleman if you ever have any questions about the island. My family had a wonderful discovering the island and are planning to come back next year!!! Clean, quiet and, as advertised, a great outdoor shower. We rode bikes all over the island and it was great starting point to go everywhere. I thought. I would recommend this listing to a family or a few couples who want to get away affordably. We recently returned from a week's stay at this wonderful Vineyard Haven rental. It was a pleasure to deal with the owner who took great care to make sure that we settled in and that all was well with the house during our stay. Although a 25 plus year visitor to the Island for our annual week of rest and relaxation this was the first time we stayed near Vineyard Haven and I'm thrilled that we did! We were able to enjoy Lake Tashmoo, Mink Meadows, Grace Church lobster rolls, and great shopping and restaurants (our favorite being the Blue Canoe) all within minutes from the house. The house is in a private setting and extremely well represented by the photos. We would certainly recommend the home to others and hope to rent it again next year for ourselves.